Some 300 feet below my perch, a road disappeared into the side of a mountain. I made my way down the heavily wooded, steep slope, sliding as often as walking. My shoes filled with dirt that was still moist from the spring thaw. And then I was at the bottom, standing on an old roadway with weeds sprouting through the cracked pavement. I was staring at a new, shiny silver, domed structure that ran along the road for about 300 yards and ended at a decaying tunnel entrance. A stack of slick racing tires stood nearby, the final clue that I had found the place that symbolizes all that is fantastic about motorsports. Now I just had to figure out how to tell the story. Ask anyone why racing matters and, inevitably, someone pipes up that motorsports produces new technology that eventually makes street cars better. While that might have been true 50 years ago, it's all too easy to poke holes in the statement today. Modern racing cars are so tightly regulated—to control costs and competition—there are few development challenges left for the creative engineering mind. Racers, however, are a resourceful lot, and the most obsessed would gladly saw off a toe for a tenth-of-a-second advantage. They struggle and experiment and do move the needle forward, but in such minute steps, there's little to crow about except in some dense engineering paper. Since those improvements are usually invisible to the casual observer and no team would voluntarily disclose a secret advantage, we never hear about them. Yet we all love the stories of the maverick inventor or innovator who gains an edge through genius and hard work. Remember Penske's acid-dipped Trans Am Camaro or the STP Turbine car that nearly won Indy? What about the 1997 McLaren MP4-12 "fiddle brake," a second brake pedal used on F1 cars to slow the inside rear wheel and help the car corner faster? It was banned in 1998. Those tales become part of motorsports lore. In the winter of 2007, I got a once-in-a-decade tip about one such racing edge. While touring a scale-model wind tunnel in Indianapolis and listening to my guide explain the exorbitant efforts engineers expend to ensure the tunnel simulates the real world—they use precise, Ferrari-priced race-car models and rolling roads, among other measures—I asked why they didn't measure downforce and drag by driving real cars down a real road. I knew the answer—changing weather conditions would affect the results—but I wanted to hear him say it. "What you need," said my guide (anonymous by request), "is a car tunnel. One about a mile long, and flat. Since it's underground, the air conditions remain relatively constant. That would provide solid, repeatable data." I chuckled. Who had the money to build such a facility? And where? "What if," he continued, "someone found an abandoned tunnel and repurposed it?" That was all the impetus I needed. I went home and started digging, unraveling a chain of events that began over 100 years ago. "Yeah, I drove in the tunnel. In fact, I crashed in it," former IndyCar driver Darren Manning said last fall. If he had been standing next to me and not on the phone, I would have kissed him. After years of searching for information on the mystery tunnel, Manning was the first person I'd found who agreed to speak on the record about it. Some backstory is required: That tip I got in Indy was no red herring. In the late 19th century, steel baron Andrew Carnegie and second-generation railroad tycoon William H. Vanderbilt joined to build a new rail line in Pennsylvania between Harrisburg and Pittsburgh. Work started in 1883; the route crossing the Allegheny Mountains required nine tunnels and was nearly complete when skittish investors pulled out. Construction stopped in 1885, and the tunnels were abandoned until the Thirties, when some well-meaning bureaucrats repurposed the route and its tunnels to build America's first superhighway, the Pennsylvania Turnpike. Opened in 1940, the highway proved so popular that by the early Sixties, the two-lane tunnels were choke points on the four-lane motorway. By 1968, three of the tunnels were bypassed and again left to the elements. Locals surely spelunked the abandoned tunnels, and their exploits eventually wound up on the Internet. I found one blogger who mentioned that the Laurel Hill Tunnel, about 50 miles east of Pittsburgh, looked to be in use. For what, the blogger didn't know, but he posted pictures of race tires stacked near the tunnel entrance. Two of America's greatest racing enterprises have major ties to Pennsylvania. Roger Penske attended Lehigh University in Bethlehem, and Chip Ganassi's racing operations are partially headquartered in Pittsburgh. It didn't take a genius to finger Ganassi as the likely owner of the Laurel tunnel. He grew up in Pittsburgh and his father, Floyd, was a very successful businessman. My curiosity had turned to a fever. As much as I love motor racing, I equally cherish sharing with others why racing is—beyond the track—such a fascinating pursuit. Here, I imagined, I had the makings of a tale that even those who care little for racing could appreciate. I pictured a bunch of lunatics tuning and tinkering with race cars in a secret underground test facility. In my warped head, the tunnel was the automotive version of Area 51, the airfield in southern Nevada where the government allegedly tests captured UFOs. Obsessed? Maybe, but as filmmaker John Waters once said, "Life is nothing if you're not obsessed." So in the spring of 2007, I turned off the Pennsylvania Turnpike at the Somerset exit, headed west on Route 31, parked my car at the edge of the woods, and took a walk. "If you get a Ferrari," Ganassi said, standing in his RV at Mid-Ohio, "you can drive it in the tunnel." There it was, my golden ticket, the one I'd been trying to land for five years. Although I had found the tunnel during my 2007 hike, my repeated requests to Ganassi's PR staff to do a story had been denied. I made countless pitches: Set an underground speed record. Use the tunnel to test a new Corvette. The Ganassi guys were wonderfully nuts—surely they'd bite. Also, I wanted to know: How does one buy or lease a tunnel? What's it cost? How do they conduct the testing? What information does it provide? Clearly, Ganassi was onto something. His IndyCar team won four straight championships from 2008 to 2011. Also, the tunnel had become an open secret in the racing community. In late 2007, a few months after my walk, Racecar Engineering ran a huge story on Laurel Hill. When I saw it, I was crestfallen and enraged because Ganassi's folks said the place was off-limits, but then I read the piece and realized the author was working off the same thin information I was. He hadn't gotten in. There was still a story to tell. In the meantime, snippets about the tunnel appeared in other magazines. At one point, Ganassi even admitted its existence. Surely, I naively figured, he'd relax and let me in, since I must have been the first journalist to ask. In that RV at Mid-Ohio, I took my shot. Here's the thing you might have guessed about Ganassi: The guy's a genius. That day in the RV, before I had a chance to bring up the tunnel, he described a plan for an open-source racing series, where any garage tinkerer could take a shot at designing parts for Indy cars. He thought, and I agreed, that his plan could return racing to the technological frontier without skyrocketing costs. We ran a piece about it a few months later [November 2012]. Ganassi, who holds a finance degree from Duquesne University, built his team over a quarter century. Racing is his sole business, winning is his obsession, and to guys like me, he's a hero, even more than the drivers who pilot his cars. I secured that Ferrari, but by then, another mention of the tunnel appeared in yet another magazine. Ganassi grew fearful of publicity, and my idea was nixed yet again. As frustrated as I was, I could see his point. Racing history is full of new ideas that get banned in the interest of greater competition. If he crowed about his private tunnel, that might be the nudge the sanctioning bodies needed to ban it. Then, last spring, in a magazine profile, Ganassi offhandedly mentioned Laurel Hill: "It's not a secret tunnel. It's a private tunnel." It seemed every motor sports journalist except me had found a way to write about the place. Playing by the rules, I had failed. Two weeks after reading that story, I drove back to Pennsylvania. As if on cue, my phone battery died just as I reached the complete darkness of the tunnel's midpoint. I couldn't see a thing, but I could hear a slight whooshing sound in the distance growing louder. Something was coming. I scrambled to the wall just in time to see a faint light appear. A lone cyclist pedaled past, missing me by inches. If Ganassi wouldn't let me in the tunnel, I figured I should at least explore a surrogate. 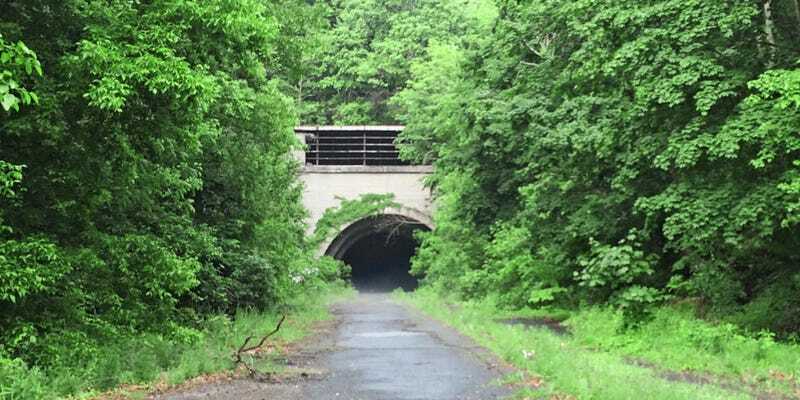 Two of Vanderbilt's original portals, which were sold to the Southern Alleghenies Conservancy for $1 in 2001, are regularly explored by vandals, hikers, and the occasional brave cyclist. The Rays Hill Tunnel is about a mile long, some 20 feet tall, and about two and a half lanes wide. Roughly one-third of the way in, the temperature had dropped 20 degrees and the humid summer air had congealed into a thick fog. Back at the overgrown entrance, I marveled at the massive 12-foot ventilation fans that still spun on their shafts and the three-story offices set into solid rock. It's difficult to assess exactly how much was spent to build each tunnel between the Vanderbilt/Carnegie operation and the PA Turnpike, but the figure is likely in the hundreds of millions. I have no idea what Ganassi paid for the Laurel Hill Tunnel or if he even owns it. Repeated requests to the Pennsylvania Turnpike Commission (PTC) for that information resulted in responses like "Why do you need to know?" or "We'll get back to you." They never did. Instead, every time I called the PTC, the follow-up call came from John Olguin, Ganassi's PR man, who urged me to leave this story alone. The eastern side of Chip Ganassi's private tunnel. The left lane is runoff area, complete with tire stacks to stop a runaway car. Photo by Road & Track. Odd, right? Why does the PTC have a bat phone to Ganassi? And why is the tunnel such a big secret? There's a Wikipedia page on the Laurel Hill Tunnel that mentions Ganassi's use, and a two-minute Internet search revealed that Ganassi even has a patent on the idea. In 2006, Ganassi and Ben Bowlby (who later developed the DeltaWing race car, which Ganassi helped finance), were awarded U.S. patent number 7,131,319 B2, "Method and apparatus for testing a moving vehicle," which explains how one might measure aerodynamic forces while driving a car through a tunnel. The PTC, however, wasn't alone in its silence. Over in Somerset, the closest town to Ganassi's tunnel, I found that almost everyone knew about it, but free talk was impossible to come by. Knowledge of my presence spread through town; by late afternoon, when I arrived at Stoy Excavating, the company that I'd been told constructed the tunnel, the secretary asked me if I was that reporter asking about the tunnel. Yeah, it's a small town. And then at the hotel breakfast bar the next morning, a patron, yet another person who wishes to remain anonymous, told me to call Darren Manning. "One of the uprights failed," Manning continued, when we talked last fall. "I climbed 12 feet up the wall and slid down on my side. I nearly did the full loop on the thing." That was in 2004, the year Manning signed with Ganassi's Indy team and likely the first year the tunnel was in operation. Domed enclosure ensures that the team can park race-car haulers inside, hidden from view. Photo by Road & Track. "Have you ever seen the TV show Battlestar Galactica, when those spaceships were shot from a tube?" Manning asked. "That's what testing in the tunnel was like." He described a simple procedure: Driving west through the tunnel, he'd accelerate the car to 140 mph and coast as long as he could before stopping. Then, a turntable would spin the car around and he'd head east, but this time, he had to maintain precisely 130 mph until braking for the end. Manning's test car was outfitted with onboard data and telemetry systems and special clutches in the rear uprights that decoupled the wheels from the driveshafts, presumably to reduce mechanical drag. When one of them failed, the rear tire locked, sending Manning into the wall. "I'd been in the car for, like, seven hours, bored senseless," he said, "and not really expecting a crash. Then all of a sudden, the f**king car's doing an S-bend at 140 mph and I started climbing the wall." Generally, to combat boredom during tunnel tests, Manning played a Game Boy. Other testing challenges, however, had no real solutions. "The problem," he said, "is that it's basically 52 degrees in there, and sometimes there's moisture on the pavement. You've got stone-cold tires that don't want to hook up. Plus there were pull-back springs on the brakes, so I had to pump them like mad." A decade ago, this stack of tires was the lone clue that a racing team had taken over Vanderbilt's forlorn tunnel. Photo by Road & Track. In the tunnel's early days, the team tested nearly around the clock. "It's a test driver's nightmare," Manning said, "because you could run all night, and sometimes we did." The team was so eager for the data that the morning after the Indy 500, Manning found himself in the team van, heading to the tunnel. All this effort must have had a payoff. According to Manning, in addition to the standard aerodynamic information, the tunnel provided data that's all but impossible to obtain in a scale-model tunnel. High on the list are the effects of deforming bodywork. At speed, the wings and engine covers naturally flex, but by how much? How do those bits interact? And is there a way to maximize that movement and make it an advantage? "You have to remember," he said, "that the cars are all extremely close. Five pounds less drag or 20 pounds more downforce has a huge cumulative effect over the course of a race. Those piddly little things add up." Other noncompeting teams used the tunnel. Manning said that Toyota's now-defunct F1 team used it, Ganassi ran his NASCAR stock cars and IMSA sports cars in it, and there probably were other clients we'll never know about. IndyCar and NASCAR are, sadly, neutering the tunnel. For 2015, both sanctioning bodies further reduced the time in which teams are allowed to test. IndyCar limits on-track and full-size wind-tunnel testing to 14 days, and NASCAR outright banned running a car for testing outside its scheduled test events. Chalk this up to another victory for parity over ingenuity. Over in England, however, the tunnel idea has taken root. A company called Aero Research Partners recently announced that it would convert a 1.7-mile unused railway tunnel for vehicle testing. The facility may be available for rental sometime in the next couple of years. I might not have learned everything I wanted to know about the tunnel, but the itch has—for the time being—been scratched enough. Maybe I'll still manage to get inside it someday during a testing session, with a notebook and a photographer. Or, more likely, I'll just have to visit the Brits. Norman Mailer once said, "Obsession is the single most wasteful human activity, because with an obsession you keep coming back and back and back to the same question and never get an answer." I can't say I agree. Racers like Ganassi obsessively chase speed and in the process show us the creative power of the human mind. And that's always a tale worth telling.